A true American breakfast should include a side of hashbrowns. 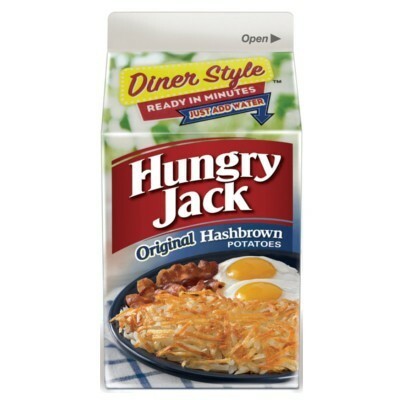 And Hungry Jack Original Hashbrowns are the best of the best. They are just the right amount of crispy goodness on the outside and soft potato on the inside. Plus, they are super easy to make. 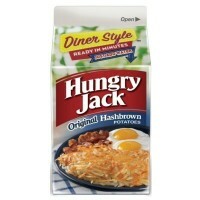 So grab a carton of hashbrowns from Hungry Jack today to create an awesome all-American breakfast. This 4.2 oz carton makes 7 servings. Add hot water and fill until the line, let stand for 12 minutes. Preheat 30ml of oil in a fry pan, then add hashbrown preparation and cook for 3 to 4 minutes each side. Idaho potatoes (dry), salt, dextrose, preservatives E222-E321 to preserve freshness. Contains sulfite ingredients. Contains GMO. Nutrition facts (for 100g): calories 375Kcal, total fat 0g (saturated fat 0g), total carbohydrate 81.3g (sugar 0g), protein 6.3g, salt 3.9g. I was looking forward to trying these because you can only find Rosti here in Switzerland but those are the authentic US hash browns, I'll buy more !!! ... les hashbrown se présentent plutôt en galettes mais là... impossible d'en obtenir !